AirPrint compatible printers… who needs them? 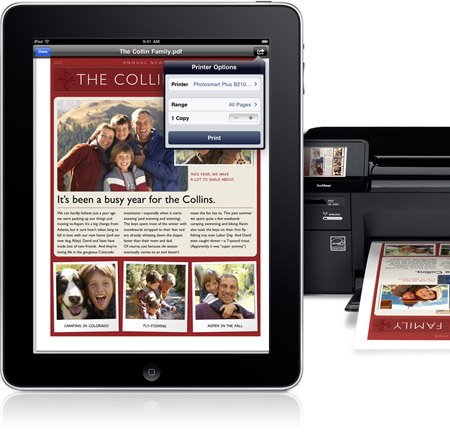 The much vaunted wireless ‘tap and print’ feature, AirPrint, however is currently only supported by three Hewlett-Packard printers: Photosmart, LaserJet Pro and Officejet. Well to be fair, to the non techies it’s probably true… however, to the innovative sorts out there determined to find another way it’s not true… because there is a way to use AirPrint with any printer. Being a poor windows user, and not wanting to shell out a few grand for a decent Mac, even though it has its appeal. I decided to try the solution from Javox and voila it worked for me. Running the CMD console as an administrator (which you do by selecting ‘All Programs’, ‘Accessories’ and right clicking on the CMD option and choose ‘run as administrator’). Sharing the printer (which you do by right clicking on your default printer in ‘devices and printers’ and setting the ‘sharing’ option to on). I also chose to set up a separate user just with printing permissions as you may be asked to log onto the printer the first time you print from your iPad or iPhone. Previous postHow much do public clouds cost and are all things equal? Next postHow to make the best ever christmas cake!!! “A few grand on a decent Mac” you need to check out the prices at Dixons Tax Free next time you fly – basically list price less VAT (even when flying domestically) – and delivered to your home for an additional £5.99 – you can get a 27″ iMac for just under £1200.